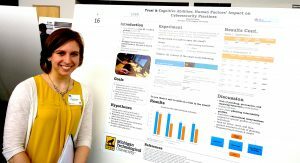 Applied Cognitive Science & Human Factors student Madeline Peabody will defend on Friday, March 31 from 12:00 pm to 1:00 pm in Meese Center 109. Her advisor is Elizabeth Veinott. Abstract: Planning can be difficult and developing techniques for evaluating plans has been limited. This thesis compares different plan evaluation techniques in a series of experiments. The main techniques discussed are the Premortem Method and Worst-Case Scenario Method. The Premortem plan evaluation method can help people reduce overconfidence and generate more reasons a plan might not succeed. Only one experiment has validated this technique; therefore, one goal of the present series of experiments is to qualitatively and quantitatively examine the effectiveness of the Premortem Method in several different planning situations. This research evaluates the extension of the Premortem to shorter planning time periods, evaluates the effectiveness with team generated and executed plans, and compares the use of this technique among individuals and teams. In Experiment 1, 52 Army Cadets operating in teams completed six time-constrained field exercises that required planning, half using the Premortem and half using a standard Military plan evaluation process. Compared to a control condition, when teams used the Premortem they had fewer fouls and less fixation with no change in execution time. 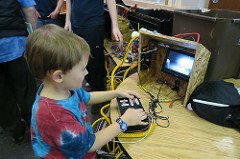 In Experiment 2, 72 individual participants from university organizations used the Premortem Method or Worst-Case Scenario Method to evaluate their group’s plan for an engineering task. Results from Experiment 2 indicated that there was no statistically significant difference in the number of reasons and solutions generated between methods. To further examine the relative effectiveness of these two plan evaluation methods, and the influence of group dynamics, Experiment 3 compared the efficacy of the Premortem and Worst-Case Scenario Method among groups and individuals in face-to-face settings with a complex and unfamiliar plan. Eighty-two participants generated more reasons with the Premortem Method than the Worst Case Scenario Method, and groups generated more solutions than individuals did. Overall, the participants in groups using the Premortem Method produced more reasons and solutions than participants using the Worst-Case Scenario Method and individual participants using the Premortem Method. These studies extend prior work by validating that the Premortem is effective in short planning horizons, demonstrating that it works for individuals and teams, and clarifying potential boundary conditions. This research advocates several directions for future research, and suggests possibility of future implementation as a virtual tool or application. 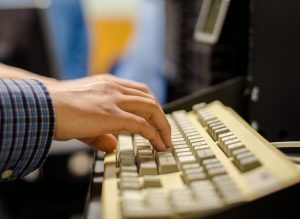 The Department of Cognitive and Learning Sciences and the William G. Jackson Center for Teaching and Learning (CTL) have developed a new course entitled “Foundations of Online Teaching.” Beginning in Spring 2018, it will be offered in spring and summer semesters as ED5101, but this summer, it will be offered during Track A as a special topics (ED5540) section with the same name. In order to promote best practices in online teaching, the CTL has been authorized to annually provide $500 in additional compensation to up to 20 faculty members and GTAs who enroll in this course to improve their online instruction. Full-time faculty must enroll in the course as normal and may refer to the Employee Education Program or tuition reimbursement information. GTAs or part-time faculty would need to enroll in the course as a normal one credit class. All participants wishing to receive compensation must, no later than the end of the first week of the course, provide communication from the appropriate chair or dean indicating their involvement in online teaching within their unit (should the compensation limits be reached, the time of receipt of this letter will determine priority). Individuals must also complete the course with a B grade or better before receiving the additional compensation. In addition, those completing the course (or who can show equivalent education/experience) will become exclusively eligible for additional grant money (beginning late Summer 2017) to support the development or revision of online courses. Funding for this program comes from the Online Learning Technology Fee through a cooperative effort between Information Technology and the CTL. Questions about Michigan Tech’s Employee Education Program can be directed to Benefits Services. Questions about the course or the $500 in additional compensation can be directed to Tom Freeman. Brittany Turner’s research, Assessing the Impact of Age-Related Declines in Implicit Memory Processes on Motor Learning, was presented at Michigan Tech’s 2017 Undergraduate Research Symposium this past week. With the assistance of Dr. Kevin Trewartha, Turner investigated whether scores on an implicit memory test are correlated with the slow process and whether age-related declines in implicit memory are related to deficits in motor learning. 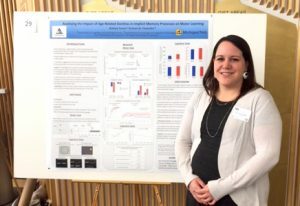 The Undergraduate Research Symposium highlights the amazing cutting-edge research being conducted on Michigan Tech’s campus by some of our best and brightest undergraduate students. The students showcasing their work today have spent a significant portion of the past year working alongside Michigan Tech faculty and graduate students to explore, discover and create new knowledge. They’ve spent long hours in the lab or out in the field designing experiments, gathering data, creating new models and testing hypotheses. They’ve applied their classroom knowledge in new and sometimes unexpected ways, and developed new skills that will propel them forward in their careers. 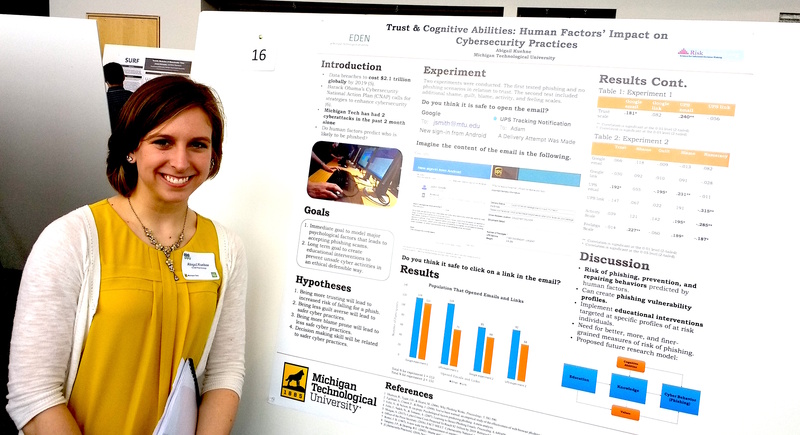 Abigail Kuehne’s research, Trust & Cognitive Abilities: Human Factors’ Impact on Cybersecurity Practices, was presented at Michigan Tech’s 2017 Undergraduate Research Symposium this past week. With the assistance of Dr. Adam Feltz, Kuehne attempts to help understand the human factors that increase vulnerability to threats in their privacy and security through internet crime and identity theft. In particular, trust and cognitive abilities appear to be two major predictors of being susceptible to phishing attacks. By determining the connection that allows/prevents the end user to susceptibility of phishing, we can implement interventions to help people protect themselves. Michigan Tech faculty, staff, students, area teachers, and community members sponsored two hundred students in grades 4-8th from seventeen schools at the 19th Annual Western Upper Peninsula Science Fair on Thursday, March 16, 2017 at the Memorial Union Ballroom.